“The Lord is calling you today! He asks us to be his disciples, to play on his team. We are never alone. In the good times and in the bad times.I know that you are aiming high. You are the ones who hold the future! Quiero que se salga afuera. Espero lío. Be active members! Go on the offensive! Play down the field, build a better world!”. With this motivational message of Pope Francis we want to encourage more young people to participate in this initiative. Copa Católica is a way to unite people as possible. The Vatican is very interested in the Clericus Cup: in addition to its global influence, the institution thinks that the values of excellence, discipline, effort and teamwork that are associated with football, are very necessary for life in modern society. We offer the fruits of this project to Our Lord and Mary, as mother and protector the protagonist this project, that is why she is in the logo created for this competition. 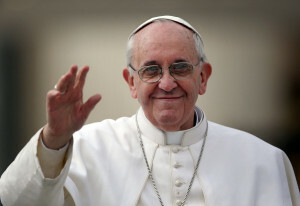 We want to keep the message of Pope Francisco, making mess and show that the Church is young. Because the Church is not what many think and say listen. If you engage in the Church, the Church is you! What is it that I expect as a consequence of World Youth Day? I want a mess. I want trouble in the dioceses! I want to see the church get closer to the people. I want to get rid of clericalism, the mundane, this closing ourselves off within ourselves, in our parishes, schools or structures. Because these need to get out!